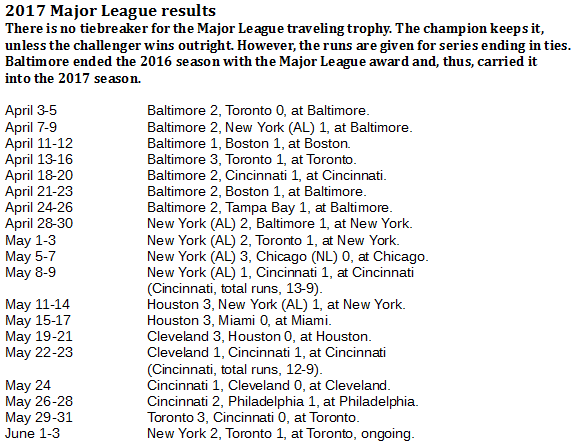 The Cincinnati Reds defended the interleague baseball traveling championship for only three days before losing it back to the American League. The Toronto Blue Jays took it from the Reds with a prodigious surge of home run power. Russell Martin batted .500 with two homers as the Toronto Blue Jays reclaimed the interleague traveling baseball championship from the Cincinnati Reds with a three-game sweep (Keith Allison/Creative Commons Attribution-Share Alike 2.0 Generic license). It was fun while it lasted, perhaps, but it didn't last for very long. About as quickly as the Cincinnati Reds won the traveling championship across big league baseball, securing it for the National League for the first time since the middle of last August, they lost it. The Reds did defend it once. 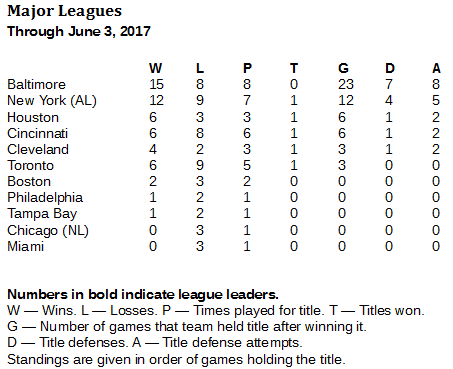 After winning the title by capturing the only game of a rain-shortened one-game series against the Cleveland Indians on May 24, they defended it by winning two of three on the road against the Philadelphia Phillies. But the schedule then sent the Reds to Toronto for three games to be played May 29-31. 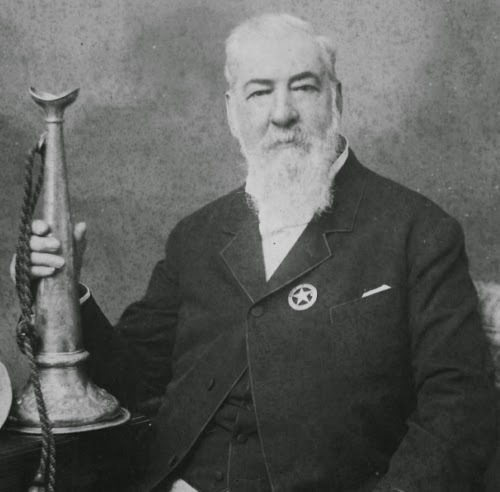 The Toronto Blue Jays were waiting with their home run bats. The Jays beat the Reds in all three games they played, outscoring their visitors by a combined 28-10. A 17-2 win in the opener had a lot to do with that total margin. Here is the rendering from baseball-reference.com of how the Jays hit against Cincinnati. 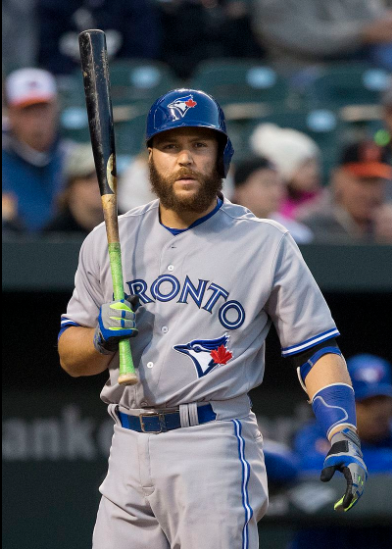 The Jays hit nine homers – two by Russell Martin and one each by seven other players. Ezequiel Carrera had six hits for Toronto in the series, followed by Martin, Kendrys Morales, Jose Bautista and Devon Travis with five each. The Jays are at home against the New York Yankees this weekend, with the Yankees winning two of the first three games. The final game of the series is on Sunday. If the Jays win, they will gain a split in the series and maintain the interleague championship, which does not change hands in a split series.